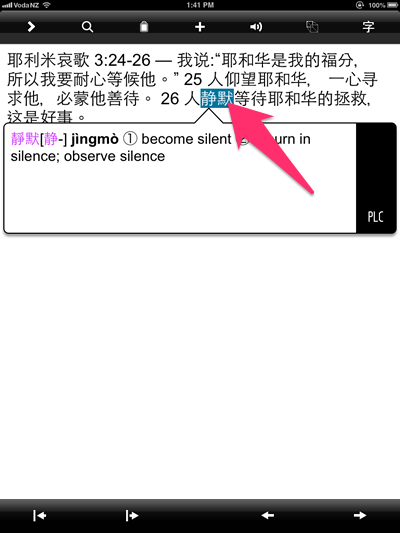 Pleco is the ultimate Chinese learning companion - an integrated Chinese dictionary / document reader / flashcard system with fullscreen handwriting input and live camera-based character recognition. 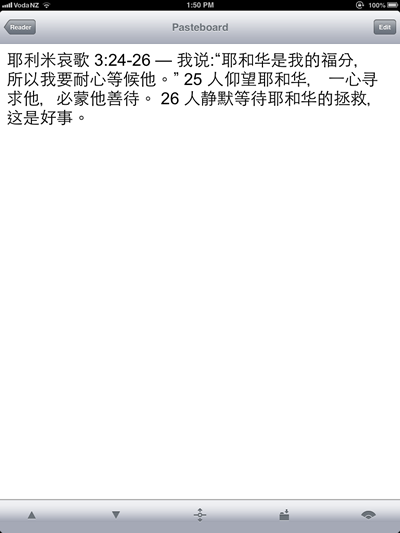 A lot of brothers and sisters working the Chinese foreign field are using Pleco on their mobile device. I am very pleased to integrate Equipd with Pleco as part of version 2.6.2. This article will help users to get the most out of this integration. 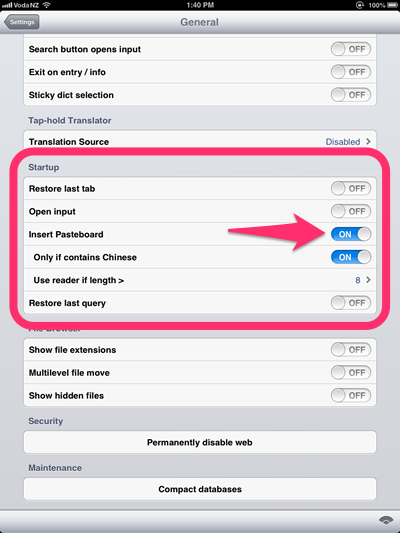 If you have Pleco installed on your mobile device then the context menu that shows when you select a character, word, or even a sentence can send the currently selected English words or Traditional/Simplified Characters straight to Pleco for translation. Once you have finished in Pleco you can then click the button showing inside Pleco labelled "Return to Equipd" to jump right back to where you were in Equipd. See screenshots below. 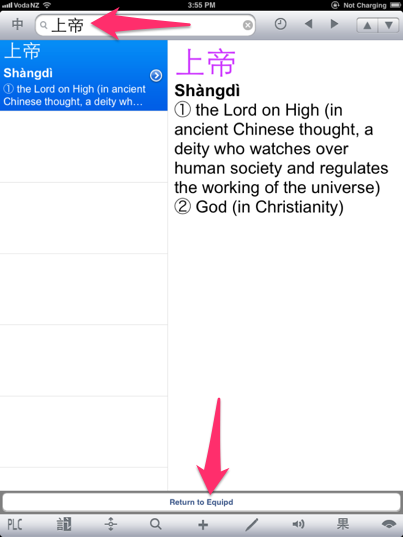 The "Pasteboard Reader" function in Pleco grabs and displays the contents of the clipboard adding pop-up definitions to any Chinese that it finds. You can then just tap the characters in the text and Pleco will show the definitions. While I cannot integrate directly with this function from Equipd, as Pleco does not offer a URL Scheme for this function, you can follow the steps below to make it much easier to work with the Pasteboard Reader and Equipd together. Look for the section entitled "Startup" which contains an option "Insert Pasteboard"
Change "Insert Pasteboard" to "ON". 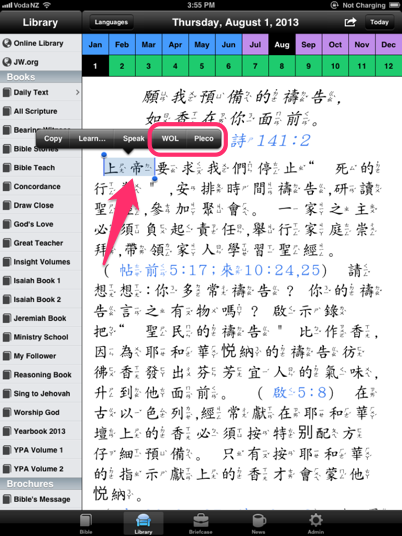 This now allows you to select a full scripture or block of Chinese Characters in Equipd, and "Copy" them - and when you switch to Pleco it will open the clipboard contents in the Pasteboard Reader! Pinyin Searches - If you want to lookup Pinyin in Pleco, you need to know that Pleco does not support Pinyin Tones in the dictionary lookup. For example "Yēhéhuá" will not return any results. As a result when you click the "Pleco" menu option Equipd will automatically strip out the tone marks - eg it will turn "Yēhéhuá" into "yehehua". The weakness with this approach is that it will loosen the search result to include similar words with the same spelling but different tones - but at least it will work. Blocks of Characters - You can select a block of characters in Equipd and use the "Pleco" popup menu option, which will break out all the words detected and list them in Pleco.